Dust off your paella pans, finally a definitive collection of recipes for this classic Spanish dish. 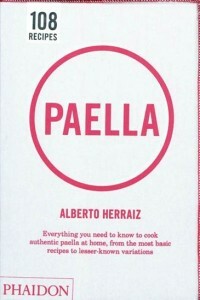 Paella is the first cookbook in English by paella master, Alberto Herraiz, and he brings all of his knowledge of tradition and technique to the table. There are 108 recipes, including some rarely seen ‘sweeter’ versions. Want to create a memorable party? Take the largest paella pan you can carry outside to create your dish in the open air. Everyone takes a turn adding ingredients and stirring the pot. There’s an entire section of instruction and recipes for creating authentic paella on an open fire or grill. The layout of Paella is stellar with its glorious red cover nicely wrapped in a cloth ‘rice’ bag. Photographs for almost every dish, including a few step-by-step ones, add to both the inspirational appeal of the book and the likelihood of success. The basic stocks and techniques are laid out at the beginning before moving on to the more elaborate dishes. There are authentic Spanish flavours and ingredients throughout the book. Barcelona-Style Thursday Paella Rice features an array of seafood including monkfish, langoustines, prawns, squid and mussels. Since this book is all about a special cooking technique, Harraiz also ventures to adapt it to different culinary traditions. For example, his Return to Paris Paella Rice with veal shank, mustard, and crème fraîche pays homage to the classic Parisian bistro dish, Blanquette de Veau. Similarily, his New York-style Paella Rice with Sausages from Around the World is a tribute to Daniel Boulud’s DBGB Kitchen and Bar. This one can even be served with ketchup, mustard or gherkins.